Tryptophan is a very important essential amino acid that can reduce pain sensitivity, stimulates the production of growth hormone, which is necessary to increase muscle mass and reduce fat mass.Tryptophan plays an extensive role in the treatment of various eating disorders, alcohol dependence, Down’s syndrome, aggressive behavior, hyperactivity and attention deficit disorder, schizophrenia, and participates in the production of niacin (vitamin B3). The state of anxiety and other emotional disorders (including with premenstrual tension syndrome). The neurosis of compulsive states. Disorders of food intake (including bulimia, overeating, some forms of obesity). Migraines and headaches of other types. Strangely enough, to get more tryptophan in the brain, you need to eat what almost entirely consists of carbohydrates, for example, foods containing complex carbohydrates like bread, rice, pasta or pure carbohydrates: table sugar or fructose. When using tryptophan for relaxation, it should be taken during the day between meals and washed down with juice or water, but not with milk or other products containing protein. It is best to take tryptophan with group B vitamins. Always take supplements with tryptophan before meals, because, in order to manifest its effect, tryptophan should connect to the amino acid transport system that will deliver it to the brain. 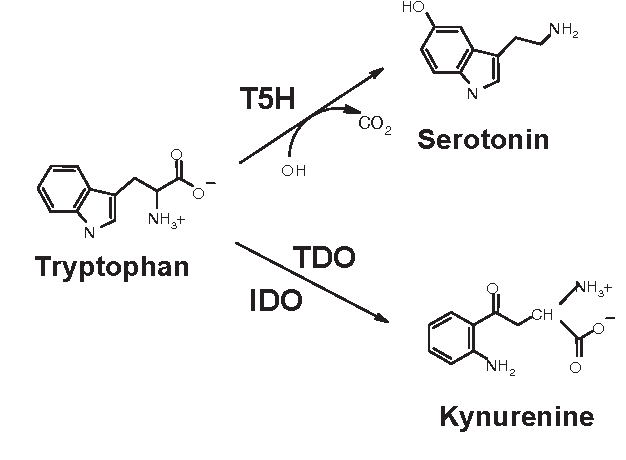 Tryptophan is well adsorbed in the gastrointestinal tract. In order to replace the amino acid consumed during protein metabolism, a healthy adult needs 3.5 mg per kg of body weight. Of all the essential amino acids, tryptophan is least represented in food – due to the fact that the level of tryptophan in food is poorly correlated with other amino acids. Single doses in excess of 2 g are not recommended, although successful tests of the Research Center for Psychiatry in Maryland have shown that there is no danger of getting addicted to tryptophan or its overdose (because tryptophan is a natural part of our body, the body does not need to change functions, as it happens with drugs). Side effects when taking tryptophan have not been identified. Asthma patients are most likely to avoid tryptophan, since any precursor to serotonin can exacerbate breathing difficulties, and high doses can cause a noticeable feeling of fatigue. Its application in pregnancy and lactation (breastfeeding) is not recommended. The best natural sources of tryptophan are products containing a large number of proteins. They are contained in mushrooms, oats, bananas, dried dates, sesame, pine nuts, milk, yogurt, cottage cheese. Tryptophan is present in most vegetable proteins, especially it is rich in soybeans. A very small amount of tryptophan is contained in corn. One of the best sources of tryptophan is peanuts, with both whole nuts and peanut butter.